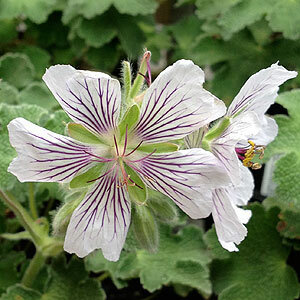 A tough clump forming perennial Geranium renardii is well suited to the cottage garden. This is regarded as a 'dwarf cranesbill' and actually comes in a number of varieties or cultivars. Foliage is a sage green flowers are white with crimson to mauve vein like markings and are held well above the foliage. Geranium renardii can be grown in containers where it will tumble down ove the edge, be used in the border, rock garden or just about any sunny position. Geranium renardii "Tschelda" have pale mauve flowers with purple veins. 'Philippe Vapelle' has deeper violet flowers. 'Walter Ingwersen' has larger flowers than the species. 'Zetterlund' is another violet flowering cultivar. Will reach around 30 - 40 cm in height and spread over .5m, and grows well in full sun to part shade in a humus rich well drained soil. Can be pruned back to keep tidy in autumn or late winter. As it forms a clump over time propagation by division in autumn or early spring is fairly easy.